Smart investors will cut out the clutter and look for these telltale signs of the e-tailer's business trends. E-commerce and cloud computing giant Amazon.com (NASDAQ:AMZN) will report its third-quarter results after the closing bell on Thursday, Oct. 25. The stock has been on fire recently, delivering a market-stomping 70% return over the last 52 weeks to build an $815 billion market cap. Investors and analysts will pay close attention to Amazon's report, hoping to glean insights worthy of an investment thesis from the company's financial data and management's comments. The report will be packed with enough data to confound and befuddle the unprepared investor. To help you make the most of Amazon's event, here are four issues that deserve a closer look. Management's revenue guidance for the third quarter points to roughly $55.8 billion. Hitting that target would work out to a 27% gain as compared to the year-ago period. Within this forecast, made three months ago, Amazon saw a 0.3% headwind from currency exchange effects. Since the dollar rate has held fairly steady against major world currencies such as the euro and the Japanese yen over the last three months, the actual currency effect should be close to management's predicted rate. Further down the income statement, Amazon set up a wide range of acceptable operating income targets. This measure of profitability should land somewhere between $1.4 billion and $2.4 billion, up from just $347 million in the third quarter of 2017. 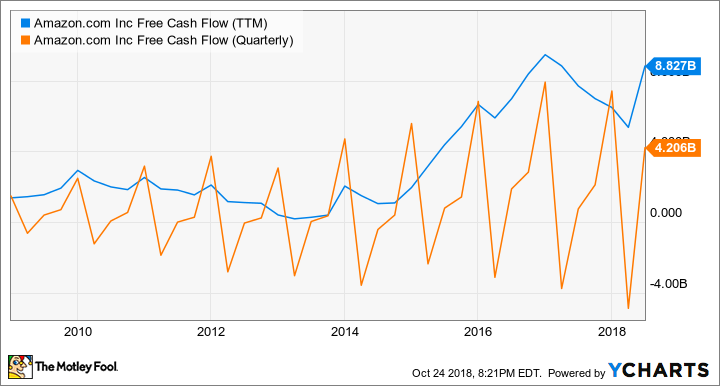 Even deeper down in Amazon's financial paperwork, the company explicitly aims to optimize its free cash flows above all else. The analysis shouldn't end with the plain old financial numbers. You also need to understand where those sales and profits came from, and how those trends should carry on in the future. In Amazon's case, the online retailing operations gather most of the company's top-line revenues, but its cloud computing services typically represent the lion's share of this company's profits. The Amazon Web Services (AWS) department, where these cloud services are reported, stood for 11.6% of Amazon's total sales in the second quarter but nearly matched the North American e-tailing division's $1.8 billion in operating profit with a $1.6 billion operating income take of its own. This high-margin segment has become an important ingredient in Amazon's bottom-line profit recipe. Furthermore, AWS grew its sales at a 49% year-over-year clip in both the first and second quarters of 2018, up from 46% in the last reporting period of 2017. Look out for shifting growth rates here. Amazon recently made headlines by raising the minimum wage for all workers to $15 per hour. It was always unclear exactly how this move would affect Amazon's operating and bottom-line profits, but this report should provide a clear view. The wage boost is scheduled to take effect in November, so you won't see it make an impact on the third-quarter results. Instead, look for guidance targets to incorporate these effects. If management doesn't offer an analysis of the minimum wage increase in the report itself, financial analysts are sure to raise the issue on the earnings call. For what it's worth, analyst firm Cowen & Co. sees the wage increase lowering fourth-quarter operating profits by roughly $370 million, or approximately 10% of that line item's total bulk. Cowen analyst John Blackledge built this forecast on an average wage increase of $2.5 per hour, based on a 50-hour average workweek for 350,000 Amazon workers. Management should be able to flesh out these projections and estimates a bit. Most of all, do keep a close eye on Amazon's fourth-quarter guidance targets. In this business, the holiday season makes or breaks the whole year. The sawtooth chart for operating profits you saw earlier is a great illustration of that seasonal pattern. The current Wall Street view calls for fourth-quarter earnings of roughly $5.90 per share on sales near $74 billion. Amazon typically doesn't offer direct bottom-line forecasts, but the revenue target should give us a comparable view of how Amazon's management expects this holiday season to work out. A generous or cut-rate projection here might move Amazon's stock more than its actual third quarter ever could.